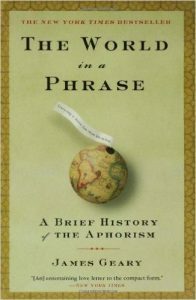 The World in a Phrase is a whimsical, humorous tour through the history of this remarkable literary form and its extraordinary practitioners. The book chronicles the varied, often idiosyncratic backgrounds of the world’s key thinkers and shows, as eighteenth-century aphorist Vauvenargues puts it, just how much “the maxims of men reveal their hearts”. The World in a Phrase in Britain is out of print, but was known as We Are What We Think: A Journey Through the Wisest and Wittiest Sayings in the World.